China intends to extend aspects of its crackdown on Islam in the north-western province of Xinjiang to all religions as is evident from the publication of proposed restrictive guidelines for online religious activity. The guidelines, according to Chinese Communist Party newspaper Global Times, would ban online religious services from “inciting subversion, opposing the leadership of the Communist Party, overthrowing the socialist system and promoting extremism, terrorism and separatism,” identified as the three evils China say it is combatting in Xinjiang. The guidelines would also forbid livestreaming or broadcast of religious activity, including praying, burning incense, worshipping or baptism ceremonies in the form of text, photo, audio or video. The guidelines, published on China’s legislative information website, are likely to be adopted after October 9 when the window for public comment closes. The newspaper quoted Zhu Weiqun, former head of the Ethnic and Religious Affairs Committee of the National Committee of the Chinese People’s Political Consultative Conference as saying that the guidelines were designed to regulate online religious information and protect the legal rights of religious people and religious freedom. “Some organizations, in the name of religion, deliberately exaggerate and distort religious doctrine online, and some evil forces, such as terrorism, separatism and religious extremism, and cults, also attempt to expand their online influences,” Mr. Zhu said. By applying the guidelines to all religions, the government hopes in part to take the sting out of an increasing number of media reports as well as assertions by the United Nations that its policy in Xinjiang involves massive violation of religious and human rights. China has denied any violations. While the crackdown on Islam in Xinjiang is the most severe because of Chinese concerns about Uyghur nationalist aspirations as well as Islamization and Arabization, references to more conservative, if not ultra-conservative strands of Islam, and the potential return to Central Asia of militant Uyghur foreign fighters fleeing Syria and Iraq, it reflects a wider Chinese effort to control religion. Similar to Xinjiang where Uyghurs report that mosques are being destroyed, authorities elsewhere in the country have destroyed what allegedly were ‘underground churches,’ including a massive evangelical church in China’s northern Shanxi province that services a congregation of 50,000. 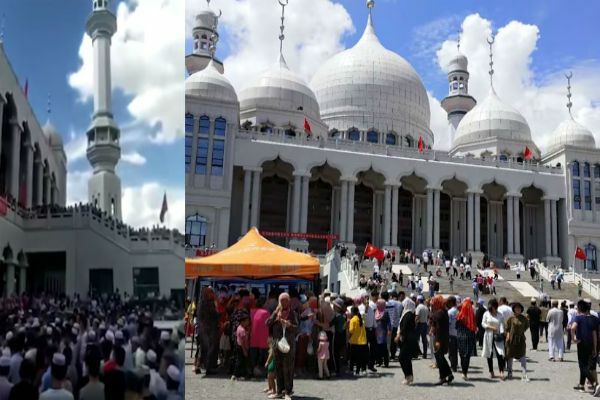 A rare, mass protest last month by Hui Muslims, who together with Uyghur’s account for the bulk of China’s estimated 20 million Muslims, forced local authorities in the northern Ningxia Hui Autonomous Region to suspend plans to demolish a newly built mosque. Former inmates of re-education camps as well as family members of detainees assert that re-education involves subjecting religious views to the precepts of the Communist party, putting allegiance to the party above that of God, and breaking with religious dietary rules and other Islamic legal requirements. The drafting of the guidelines come as China is finding it increasingly difficult to keep a publicity lid on developments in Xinjiang. The Global Times announcement came a day after Human Rights Watch issued a damning report and two days after a detailed expose in The New York Times, part of a flurry of media and academic reports published despite probable Chinese efforts to suppress critical reporting where it can. Independent Media, publisher of 18 major South African titles with a combined readership of 25 million, recently refused to publish a column by foreign affairs columnist Azad Essa on a United Nations report asserting that up to one million Uyghurs were being detained in the re-education camps. Mr. Essa was told his column had been discontinued because of a redesign of the groups’ papers and the introduction of a new system. China International Television Corporation (CITVC ) and China-Africa Development Fund (CADFUND) own a 20 percent stake in Independent Media through Interacom Investment Holdings Limited, a Mauritius-registered vehicle. There was no immediate indication that Chinese stakeholders were responsible for the cancellation of Mr. Essa’s column. China’s ability to keep its lid on the crackdown is nonetheless slipping. US officials said this week that the Trump administration, locked into a trade war with China, was considering sanctions against Chinese senior officials and companies involved in Xinjiang in what would be the first US human rights-related measures against the People’s Republic. The administration was also looking at ways to limit sales of US surveillance technology that could assist Chinese security agencies and companies in turning Xinjiang into a 21st century Orwellian surveillance state. With the media reporting and UN and US criticism putting pressure on the Islamic world to speak out, cracks are emerging in its wall of virtually absolute silence. Rais Hussin, a supreme council member of Malaysian prime minister Mahathir Mohamad’s Parti Pribumi Bersatu Malaysia (Bersatu) party and head of its Policy and Strategy Bureau, cautioned in an editorial this week against deportation of 11 Uyghurs wanted by China. “Being friendly to China is a must, as China is a close neighbour of Malaysia. But it is also on this point that geographical proximity cannot be taken advantage by China to ride roughshod over everything that Malaysia holds dear, such as Islam, democracy, freedom of worship and deep respect for every country’s sovereignty… On its mistreatment of Muslims in Xinjiang almost en masse, Malaysia must speak up, and defend the most basic human rights of all,” Mr. Hussin said. Mr. Hussin’s comments may not be that surprising given that Mr. Mahathir, since returning to power in May in an upset election, has emerged as a point man in a pushback by various nations against Chinese-funded, Belt and Road-related infrastructure projects that are perceived as risking unsustainable debt or being potential white elephants. Mr. Mahathir has, since assuming office, suspended or cancelled US$26 billion in Chinese-funded projects in Malaysia. Echoing Mr. Hussin’s statements, Ismailan, a Hui Muslim poet, posted pictures on Twitter of Bangladeshi Muslims protesting in the capital Dacca against the crackdown in Xinjiang. “They are the first people of Islamic world to stand up for brothers and sisters in #china. Muslims, our fate is connected!” Ismailan tweeted, insisting that his opposition to the crackdown and “the use of concentration camps to solve the problem” did not amount to support for Uighur nationalism.